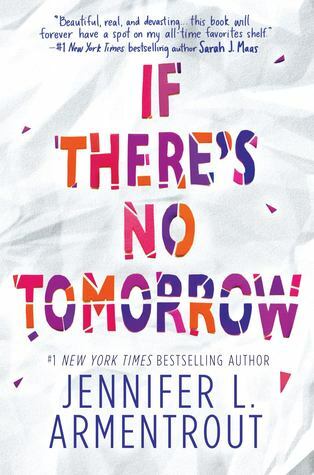 Thanks to TLC Tours, we're pleased to take part in the book tour for If There's No Tomorrow, a new contemporary YA novel by Jennifer Armentrout. Keep reading to check out an excerpt from the book! And be sure to check out the tour website for a complete lists of stop, to read all of the excerpts this week! I couldn’t speak. There… there was something in my throat, in the back of my throat. My arm twitched without warning, and there was a tug at the top of my hand. “She’s starting to wake up,” a female voice interrupted my thoughts from somewhere on the other side of the tunnel. Warmth hit my veins, starting at the base of my skull and then washing over me, cascading through my body and then there were no dreams, no thoughts, and no voices. Joanna’s had been a staple in downtown Clearbrook since I was knee high to a grasshopper. The restaurant was kind of stuck in the past, weirdly existing somewhere between big hair bands and the rise of Britney Spears, but it was clean and cozy, and practically everything that came out of the kitchen was fried. Plus it had the best sweet tea in the entire state of Virginia. I pressed my lips together, because yep, that’s what it looked like. Everything about Dary was dramatic, from the often abhorrently bright clothing she wore to the super short hair, cropped on the sides and a riot of curls on the top. Right now her hair was black. Last month it was lavender. In two months, it would probably be pink. “No point in denying that. It’s true.” And I had no problem admitting it. I wanted to go to college and study anthropology. Most people would ask what in the hell would you do with a degree in that, but there were a lot of opportunities like working in forensics, corporate gigs, teaching, and more. What I wanted to do actually involved working in museums, so I would’ve loved a trip to D.C. I swore half the money I made waitressing at Joanna’s went to buying books instead of my savings account, but I couldn’t help myself. For the most part, the only time anyone under the age of sixty came into Joanna’s was on Friday nights after the football games, and sometimes Saturday evenings during the summer. Definitely not on Thursday nights. Joanna’s made its bread and butter off of certified AARP members, which was one of the reasons why I started waitressing here during the summer. It was easy and I needed the extra money. The fact that Skylar Welch was standing just inside of Joanna’s, ten minutes before closing, was a shock. She never came in here alone. Never. I’d spent the last million years harboring a rabid case of bitter jealousy when it came to Skylar. But the worse part was that she was genuinely sweet, which made hating her a crime against humanity, puppies and rainbows. Tentatively walking forward like she expected the black and white linoleum floor to rip open and swallow her whole, she brushed her light brown, blonde at the end, hair over her shoulder. Even in the horrible fluorescent lights, her summer tan was deep and flawless. “Tons,” I replied dryly. The list was longer than my leg and arm combined. The corners of my lips started to turn down. What was there to know about me that Sebastian didn’t already know? I was legit boring. I read more than I actually talked to people, And was obsessed with the History Channel and shows like Ancient Aliens. I played volleyball and even though I really wasn’t that good at it, our school sucked so I made the team. Honestly, I would’ve never started playing if it hadn’t been for Megan conniving me into it when we were freshman. Not that I didn’t have fun, but yeah, I was as stimulating as white bread. Well, I was scared to death of squirrels. They were like rats with bushy tails, and they were mean.No one knew that, because that was super embarrassing. But I doubted that was what Skylar was talking about.